At the end of August, I was asked to make a trip from Whitehorse, Yukon to Wrigley, Northwest Territories for a short presentation. While researching the travel options, I came to the realization that the cheapest and most convenient way for me to get there was to fly - by charter. 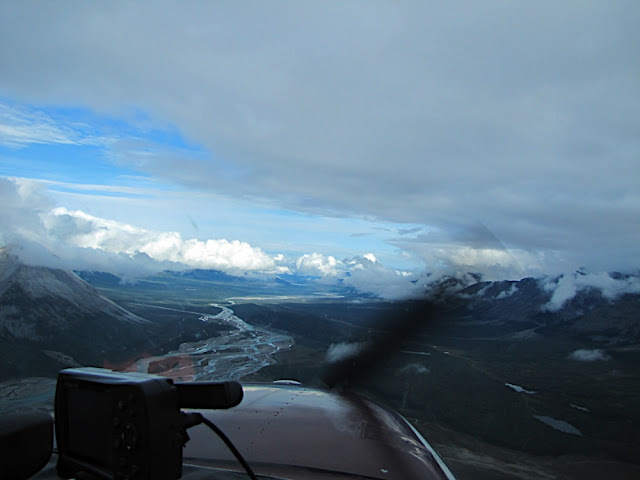 I made arrangements with Alkan Air to fly by Cessna 172 from Whitehorse to Wrigley and back in one day - all of which would be weather dependent, of course. This is how you would drive from Whitehorse (A) to Wrigley (B) Click here to view a larger map. It has taken two months to make this posting because I thought I had transferred the pictures from my camera to my computer when I hadn't, and then formatted my camera's memory card, erasing the pictures. Fortunately, I was able to recover the pictures using a camera card recovery program. If you think that formatting a camera card multiple times to get rid of old pictures will erase them forever, let's just say that you're very, very wrong. The other delay in making this post was the dilemma I faced about bombarding you with tonnes of pictures to try and share the experience and diversity of landscape, or to just share the cream. As tempting as it was to do the latter (really, it's so much easier and I wouldn't want you to be bored with a bombardment of pictures that you may or may not find interesting), I chose to try and strike a balance between the two. From the very get-go, Michael's Meanderings has been about sharing the experience of the journey. So let's get this adventure underway! It was an early start to the morning. Because of the weather, we still didn't know if we'd be going. The forecast for the week was not a good one, but the forecast for the day had been promising. If we didn't fly out that day, there would no longer be any point to the trip. If we got to Wrigley (or part way) and got weathered in, it could be days before we would be able to fly back out. Fortunately, it appeared that we were good-to-go. The 172 isn't a big plane, and it certainly isn't fast, leaving lots of time to enjoy the scenery but far too much time if you have a bathroom emergency. 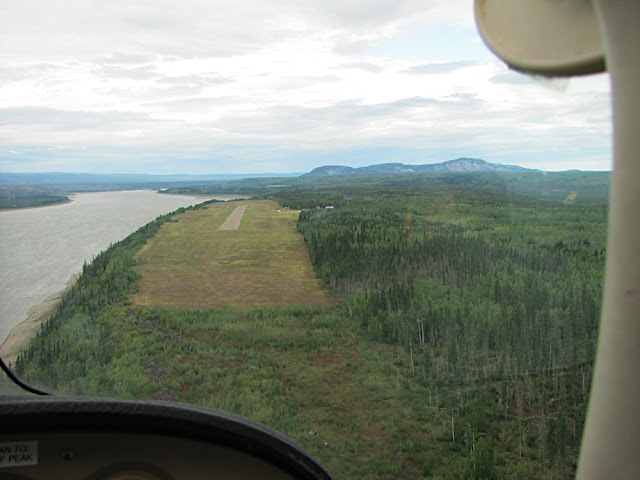 The landing strips in the country between Whitehorse and Ross River (which lies en route) are few. The landing strips between Ross River and Wrigley are even fewer. This early in the morning, Whitehorse was like a ghost town. 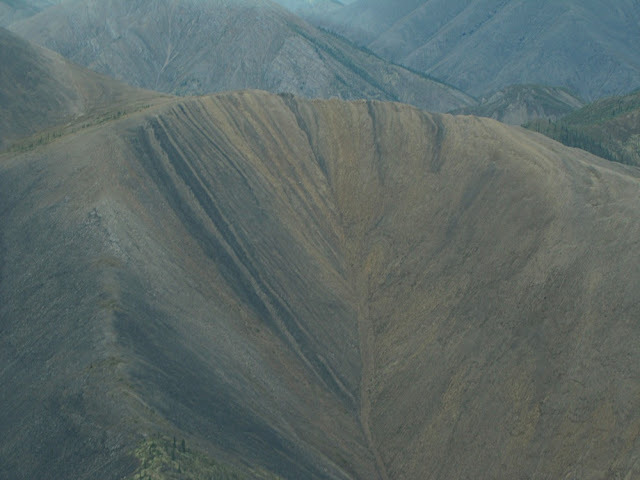 We headed for the smooth-topped mountains that run along the East side of the Yukon River valley near Whitehorse. They look so close and accessible in the evening light, but a flight over the area reveals that getting to them on foot would take a fair bit of time and effort. Cresting the mountains we saw a large, low-lying cloud bank. The flight was subject to Visual Flight Rules (VFR), so we weren't allowed to fly right through the clouds, no matter how clear it might be at our destination. Maybe we wouldn't be getting to Wrigley after all. 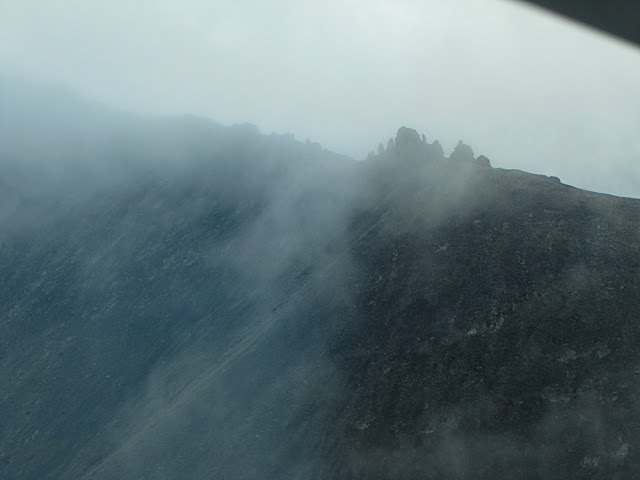 We were forced to descend into the valleys, below the clouds. Snow-kissed peaks began to emerge. While the snow would melt later in the day, it was the end of August and the snow was a sure sign that winter would be arriving soon. We nosed into one valley, only to be forced out by the clouds. We tried another with similar results. My pilot (who was excellent) knew which valley had the greatest potential, even if it wasn't the most direct. We went for that one. Based on the weather, I was pretty certain that we wouldn't get through. The pilot explained that if we couldn't get through the valley he was thinking of, that would be the end of the trip. 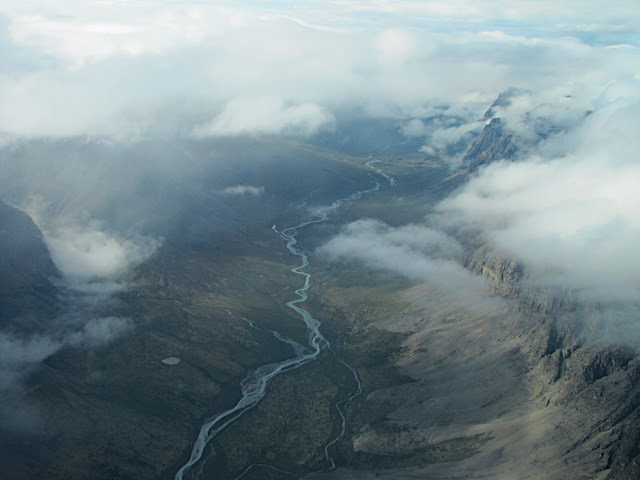 We had passed over the Teslin River and the South Canol. I finally got to see what it looked like on the other side of those mountains I could see from the road. We rounded a mountain and suddenly the country looked familiar. We were near Ross River. 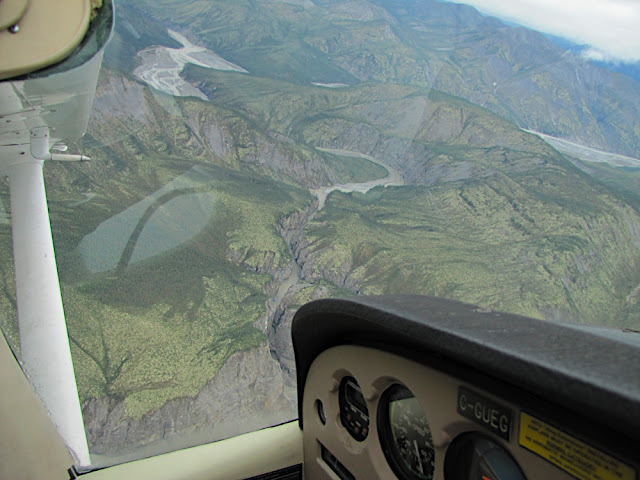 We circled over top of Ross River, checking the airport visibility for another pilot who was Ross River-bound, but it was obscured by a blanket of cloud. 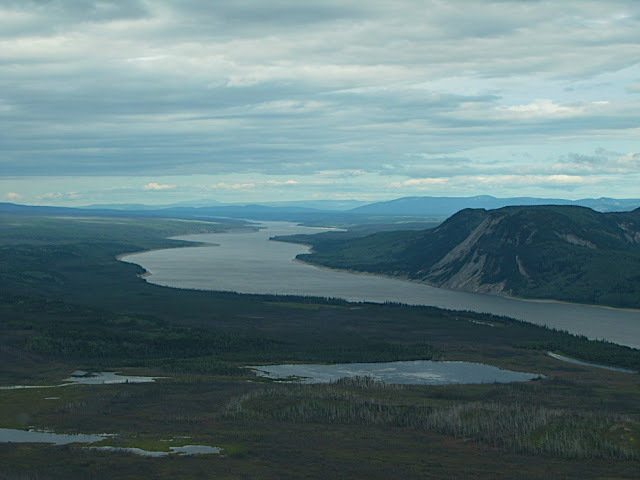 Past Ross River, I could see the North Canol to our West. The terrain seemed less mountainous. The weather seemed to be improving. Our hopes raised that we might make it to Wrigley. Although we could make it to Wrigley, my pilot wanted to stop and fill the fuel tanks while we had the opportunity. An excellent call and just one more reason why I was happy with my pilot. Safety first! There weren't any other air strips between our fuel stop and Wrigley. The runway had huge waves in it and, as the wheels touched ground, the plane ramped off them from one wave to the next. The stop was brief. Before long, we were back in the plane. Shortly after we took off, another plane came in for a landing. The terrain changed quickly. 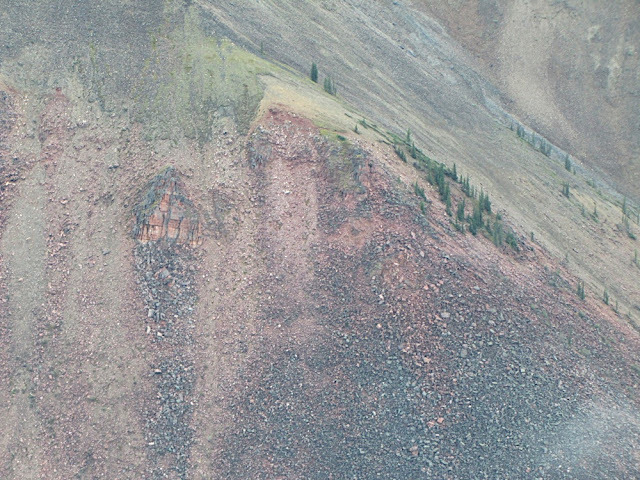 We were back into bigger mountains near the Yukon/NWT border. 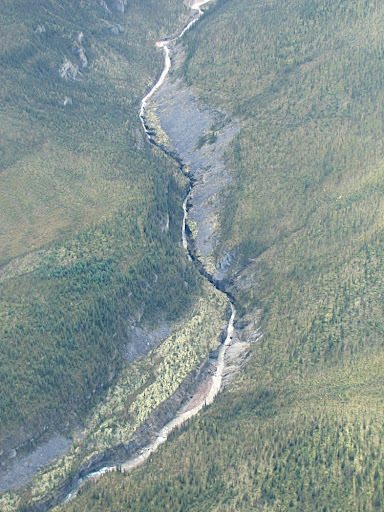 Although we'd made it past Ross River, nothing was certain. The clouds were back and now we were in the real mountains. 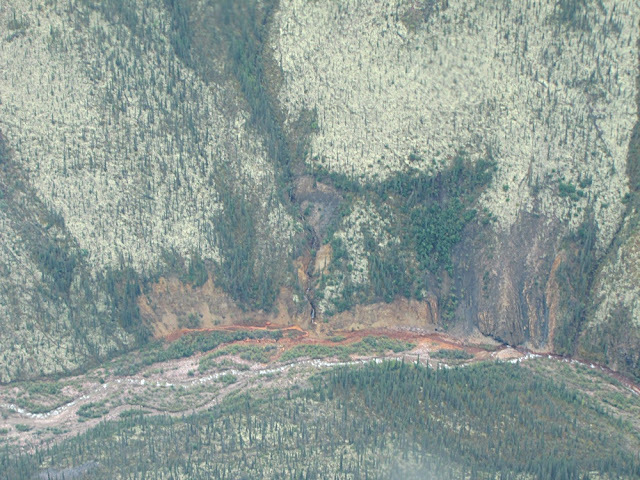 Ice-capped and foreboding, if a plane were to go down here, there would be slim chance of survival, let alone recovery. My pilot kept playing it safe, trying one valley and then the next, making sure that we could always see where we were going. As a pilot, it would have been so tempting to take the plane up above the weather, but not safe at all. Fortunately, we got around the system. 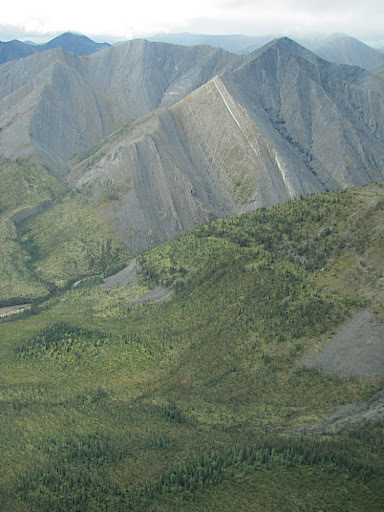 Now well into the Mackenzie Mountains, we were getting so close. The mountains dropped away into a large, broad valley. 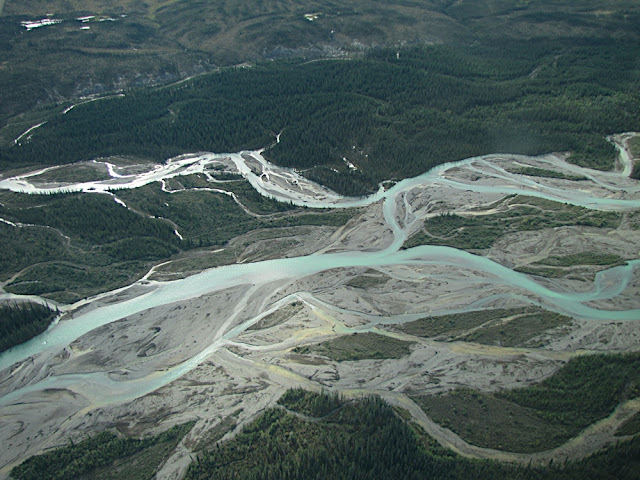 The Mackenzie River Valley. We had made it. 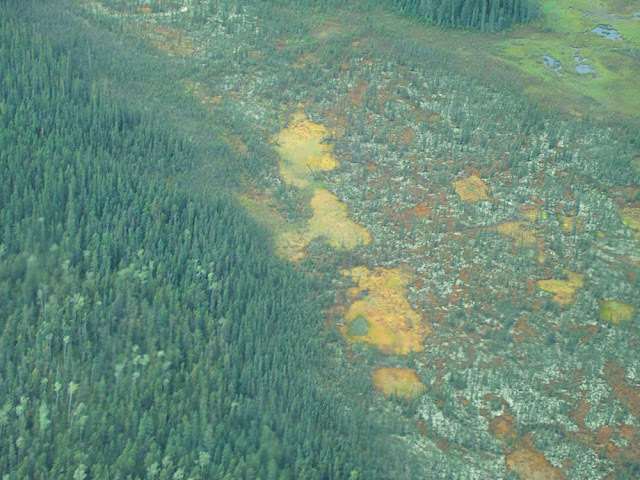 The Mackenzie was a welcome sight. We had crossed a continental divide and I was back in Dehcho country. 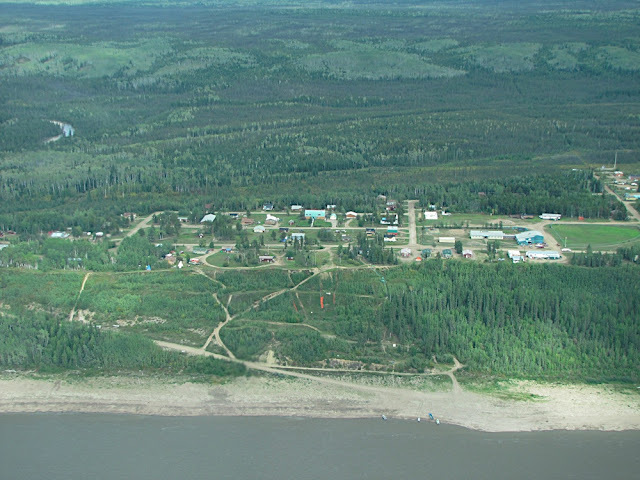 And there was Wrigley (Pehdzeh Ki), high on the banks above the Dehcho. We were a little late for my presentation but that could be pushed back later in the day. We had made it. A few hours on the ground and we would begin the journey back through even more spectacular country. But that's another entry for another day.